E-News | New NTDC Website! 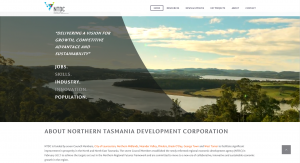 NTDCs website has recently undergone a revamp to assist in providing more efficient communication and engagement with key stakeholders and the northern region community. The new website includes a separate Regional Economic Development Plan (REDP) page that provides information and allows any interested parties to provide feedback directly to NTDC. Another key addition to the site is the Business Support in Northern Tasmania page, with the purpose of highlighting facilities available to new and existing businesses by using the map within the page. As NTDC recognises that finance and funding is crucial for a business to grow and one of our actions is looking into helping businesses and entrepreneurs in our region access finance and funding. Through actively engaging with stakeholders and making the process easier for all, a section of the business support page has been created to highlight options for both start up and expanding business funding. Check these links out to see for yourself!